The Sigatoka Ironsands Project lies within SPL1495, on the south coast of Viti Levu, the largest island of Fiji. It is located approximately 80km south of Nadi and 120km west of the capital, Suva, and is near the town of Sigatoka. SPL1495 covers an area of 2,522.69 hectares on the plains at the mouth of the Sigatoka River, the river itself and an area offshore. The satellite image below shows the main geological features of the Sigatoka area. The alluvial sands cover a down-thrown fault block and are underlain by a combination of marls and limestone debris. The Sigatoka river course was initially along the western margin of this alluvial plain and has migrated eastward, gradually building up the large washed sand deposits with the assistance of the prevailing southeasterly trade winds and ocean currents. Large volumes of sand containing magnetite have accumulated on the western side of the river mouth, as is evident in the satellite image. The targeted sand comprises sediment that was eroded from magnetite-bearing volcanic and intrusive rocks inland carried toward the sea by the river. As the river neared the marine outlet, the action of wind, current and waves has produced concentrations of heavier minerals while removing clay-sized material. 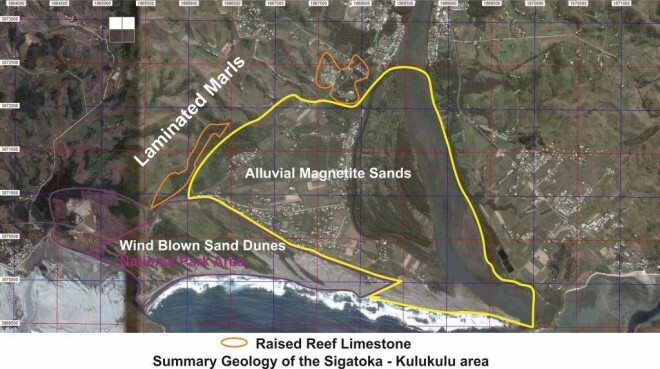 Exploration confirmed the presence of magnetite and other heavy minerals in the Sigatoka sand deposits, and exploration by Dome has now quantified an initial resource. Magnetite as a source of iron for steel making has plenty of potential. Its concentrates command a premium over the price of bulk iron ore because of its purity and use, for example, as a feedstock for specialty furnaces, in the recycling of steel and iron. The Sigatoka iron sand deposits contain other heavy minerals such as ilmenite, and also reclamation sand and gravel add value. Based on exploration undertaken by Dome, a Maiden JORC 2012 Resource Estimate of 131.6 million tonnes was announced in October 2014, which included Indicated Mineral Resources of 25 million tonnes @ 11.6% HM at Sigatoka River, and Inferred Mineral Resources of 100.7 MT @ 17% HM at the onshore Kulukulu prospect and 5.9 million tonnes @ 11% HM at Sigatoka River (see ASX release dated 10 October 2014). The Resource consists of detrital magnetite and other heavy minerals in a coastal sand deposit. In addition to magnetite concentrate, non-magnetic heavy mineral concentrate and sand and gravel suitable for industrial or land reclamation uses are expected to be produced during processing. In early December 2014 Dome received an Environmental Impact Assessment report prepared by independent environmental specialists, Corerega Environmental Consultants. The report concluded that “The proposed mining, dredging and mineral extraction development project is likely to have significant economic benefits to the local area, the region and the Country of Fiji and local residents are likely to benefit from the increase in productivity of land, river and marine environment and through job opportunities”. In October 2015 formal approval was received from the Fiji Department of Environment of the Environmental Impact Assessment (EIA) report on the Sigatoka Project (see ASX announcement dated 15 October 2015). Sonic drilling resumed on the Company’s industrial sand-magnetite Sigatoka Project in July 2017, consisting of approximately 126 sonic drill holes, and a further 68 sonic drill holes was completed in December 2017. The program was designed to drill parts of the sand deposit on Koroura Island not drilled previously and on freehold not drilled in sufficient detail in earlier programs. Data collected will be used to update the existing JORC 2012 report, and is being conducted in advance of a definitive feasibility study planned to commence shortly. Dome is now proceeding expeditiously to obtain a Mining Lease which it expects during 2018. Dome proposes to complete this river dredging activity as part of its dredge mining and extraction of the magnetite, ilmenite and other heavy minerals from the sands in the Sigatoka River. In addition, subject to Government approvals, the processed sand and gravel tailing that is not required for local use after removal of commercial heavy minerals may be sold for land reclamation purposes adding further value to the iron sand mining operation. The Sigatoka iron sand mineralisation is easily accessible and mining is expected to employ low-cost dredging methods commonly used in the mineral sand mining industry. The magnetite and other heavy minerals of value are recovered as concentrates by various combinations of gravity, electrostatic and magnetic processes that are already widely used in the mineral sands industry. Once the Definitive Feasibility Study has confirmed the deposit to be economic to mine, development and concentrate production can occur very quickly. There are several features of the mineralised area at Sigatoka that should be economically advantageous when mining commences. 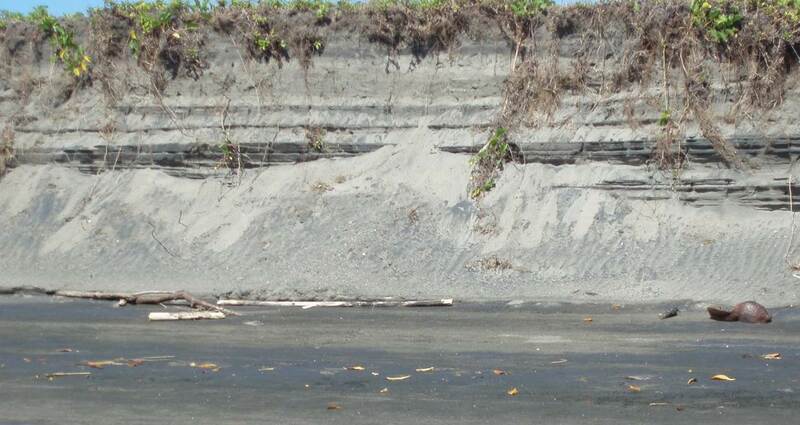 In the first instance, the organic overburden or soil layer is generally less than 1m in thickness and is immediately underlain by magnetite-bearing, orange to brown beach sand. Holes drilled to date have extended from the far north of the deposit, at its most inland development, to the river bank near the sea and show a general thickening of sand from 10-12m inland to greater than 35m of sand toward the south and east (i.e. toward the present day Sigatoka River channel and the sea). Another important feature of the sand from an economics point of view is its very low clay (slimes) content, which was 4.8% in the bulk sample and average less than 8% in all holes drilled to date. This means the washing of the material through the processing plant will likely create far less slimes, making the management of tailing and wash water easier and less costly.